I just want to write about the interesting and sweet smelling greeting card supplies I use when I make my own greeting cards. First, I think of the greeting card model and which greeting card design I expect from this model. Based on that, I collect some raw materials. Next, I pick out the favorable A4 sized background paper. Then, I choose additional sheets of A4 paper that have some art that will suit the card I want to make. Using a pencil, I draw out the background of the greeting card. Then, I use some sketch pens to draw and detail the picture and complete the sketch. Next, I stick some special things on the card. These special things include special colors and cut-outs of various papers, colors, etc. Now, for the fun part, my improvised raw material comes next. Yes, I use perfumes as part of my greeting card supplies. I spray them to give the card a nice smell. If you feel the recipient will identify the scent, and this is not what you want, then use a couple fragrances to mix it up. On the other hand, I think it’s cool to use a perfume that the recipients use or know. This way, they can recognize and appreciate the fragrance. This adds a personal touch to the card. Also, since sense of smell is a very potent sense, it tends to register in our memories. Thus, in the future, whenever they get even a whiff of that smell, they’ll always remember your card. What a way to make a lasting impression! 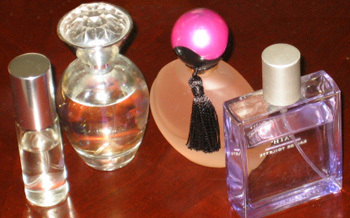 Okay, perfume is probably the easiest one, but it’s not the only option. Certain flowers, leaves, and grasses have lovely and sweet smelling aromas. Some of these plants still retain their smell even after they are dried or preserved. Hence, there’s no excuse for not using them as part of the greeting card supplies in making your card. Additionally, you could combine both. In other words, if, for whatever reason, the flower or plant has lost the intended smell, you can still use it. In this case, you’ll add the smell artificially by using a fragrance of the same smell. Finally, once the card is completed, wrap it all up, and send to that wonderful friend or relative of yours. And, give them a scented card that will make them feel happy. Join in and write your own page! It's easy to do. How? Simply click here to return to Improvising Greeting Card Supplies.